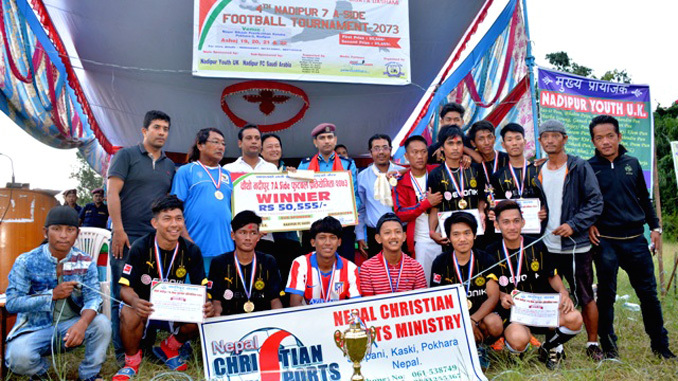 Recentfusion.com—Pokhara: Christian Football Club (CFC) won the title of fourth Nadipur Cup 7-a-side Football Tournament, in Pokhara on Sunday. CFC defeated Nadipur Football Club 3-1 in a final match. Winner CFC bagged Rs 50555 including trophy and medal. Similarly, organizer and runner up Nadipur FC got Rs 25555, trophy and medal. Yona Tamang of CFC got the prize of best defender and Raj Tamang of same club received the prize of best player. Ujwal Shrestha of Archal Bot Youth Club got the prize of best goalkeeper. Biren Gurung from same club was declared best scorere. Delight FC got the title of fair play. Earlier, CFC defeated Archal Bot Youth Club 2-1 in tie breaker of first semi final and Nadipur Youth Club beat Delight FC 2-1 in 2nd semi final to enter the final of the tournament sponsored by Nadipur Youth and co-sponsored by Nadipur Saudi Arab. Ward Police Office Bagar Inspector Kishor Lamsal, Nadipur Club president Shiva Paudel and tournament coordinator Suraj Palikhe distributed the cash prizes, trophies, medals and certificates to winner teams and players in closing ceremony.